The freedom of speech still seems to be a distant dream for Pakistanis, so much so that 16 journalists have had to seek it from foreign shores after going into exile since 2010, says a report published by the Committee to Protect Journalists (CPJ). According to the data compiled by the CPJ, the total number of journalists worldwide who have had to flee their homeland is over 450. The report, which includes only journalists who fled due to work-related persecution and remained in exile for the period of at least three months, identifies Syria as the most dangerous country for journalists. As many as 101 journalists have fled the war-torn country in last five years, followed by Ethiopia and Iran with 57 and 52 Journalists going into exile from these countries, respectively. 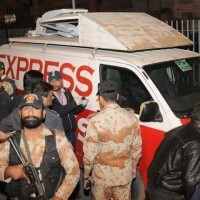 Threat of imprisonment was the biggest reason behind journalists leaving the country, as it accounted for the 42 per cent of exiles, while 40 per cent left their homeland due to the threat of violence. Other reasons forcing people to live in exile included imprisonment, violence and harassment. Out of the 452 journalists who were forced to leave their respective countries only four per cent managed to return, while 17 per cent were able to continue working in exile. Three out of 16 Pakistani journalists were forced to flee, have been able to return to the country. Among those still unable to return include journalist Raza Rumi, who had to flee after he was attacked in Lahore on March 28, 2014. Though Rumi survived the attack, his driver, Mustafa, did not. Subsequently, he had to leave the country. According to the report, United States, Turkey and Kenya were identified as top destinations for journalists who were fleeing their homeland. As many as 92 journalists fleeing their homeland ended up in the US, while Turkey and Kenya saw 71 and 65 journalists in exile, respectively.